The Nobel Prize, as seen in front of the Science Museum in Singapore. Credit: superjoseph, via Shutterstock. 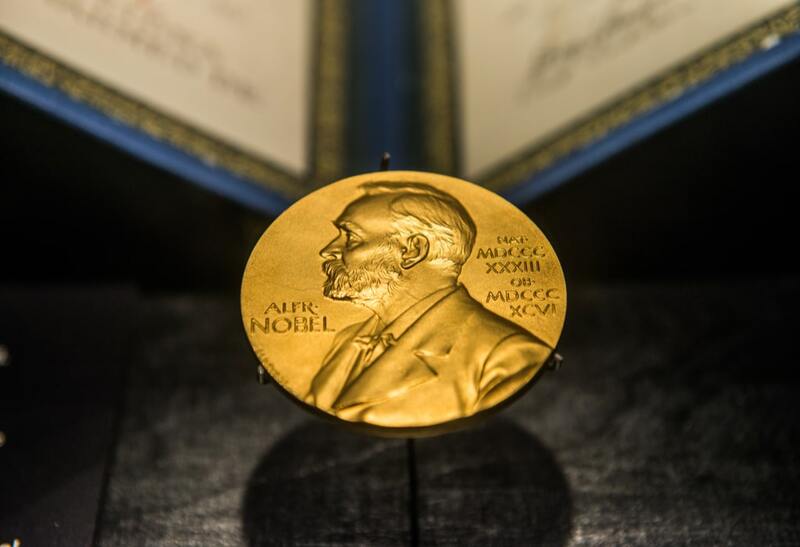 Sarah Kaplan, science reporter at the Washington Post, joins Ira to talk about this year’s Nobel Prizes and efforts to make the awards more representative of the diversity in science. They’ll also talk about the latest meeting of the United Nations’ Intergovernmental Panel on Climate Change—where the world’s top climate scientists are assessing how feasible it is that Earth might limit global warming to 1.5 degrees Celsius—and about a distant dwarf planet in our solar system nicknamed the Goblin. IRA FLATOW: This is Science Friday. I’m Ira Flatow. A bit later in the hour, how we can use logic to navigate our way through everyday arguments, divisive political issues with a little help from mathematician Eugenia Cheng. But first, this week, one of those rituals of science, the early morning wake up call from Stockholm to a handful of researchers whose work has changed their fields. Joining me now to talk about the prizes and other selected short subjects in science is Sarah Kaplan, science reporter at the Washington Post. Welcome back. SARAH KAPLAN: Thanks. Good to be here. IRA FLATOW: Nice to have you. Let’s walk through the Nobels. We’re planning to speak with chemistry Nobelist Francis Arnold later this hour. But briefly, what did she win for? SARAH KAPLAN: So Dr. Arnold and two other researchers, George Smith and Gregory Winter, were awarded the chemistry Nobel for their work on directed evolution. So this is basically, one person called it, applying the principles of Darwin in a test tube, taking advantage of natural selection and using it to direct bacteria or viruses to produce molecules that can be used for all kinds of useful purposes, whether it’s making antibodies or biofuels or drugs. IRA FLATOW: And the chemistry prize was split with two other researchers, right? SARAH KAPLAN: Yeah. George Smith and Gregory Winter. IRA FLATOW: And what did they win for? SARAH KAPLAN: So they both work on this technique called phage display, which harnesses bacteriophages. There are viruses that infect bacteria. And it’s kind of the similar principle, where you’re taking advantage of these living systems to produce useful molecules, proteins, and antibodies, that have all kinds of biological and medical applications. IRA FLATOW: And what about physics? SARAH KAPLAN: So in physics, the prize was awarded to three researchers who work with lasers. Pretty cool. Arthur Ashkin, Gerard Mourou and Donna Strickland. And they basically, not just use lasers, but use lasers as tools. So Ashkin developed this technique called optical tweezers, where he basically figured out that when you point a laser, this focused beam of light at a spherical object, the object is actually drawn towards the center of the beam. And you can use that to manipulate things as teeny as particles or as big as bacterial cells. IRA FLATOW: I’ve seen the tractor beam. It’s like a tiny tractor. SARAH KAPLAN: It’s a real life tractor beam. Unfortunately, it doesn’t work on that large a scale, because you need to keep the laser pretty focused. But it’s fun to think about. IRA FLATOW: And after winning, Donna Strickland explained what amazed her most about the research. DONNA STRICKLAND: I just think white light generation is just one of these remarkable things to see and actually– one color of light goes in to this water, or any clear anything, and out comes all the colors of the rainbow [? when ?] [? pulses ?] short and intense enough. And it’s just remarkable to sit there and go, what? Where do all those colors come from? IRA FLATOW: Shades of Isaac Newton. SARAH KAPLAN: Yeah. And it was cool hearing– Strickland actually mentioned that she uses white light generation when she teaches introductory physics courses. So that’s something that anyone can appreciate. You don’t need to be a Nobel laureate to see this really cool phenomenon. IRA FLATOW: All right. Let’s move on to physiology or medicine. SARAH KAPLAN: So the award for medicine went to two researchers, James Allison and Tasuku Honjo for their work on immunotherapy. This is basically a treatment that uses the body’s own immune system to fight against cancer. And both researchers discovered proteins that act as brakes on the immune system. So when those proteins are engaged, as they normally are, they prevent the immune system from attacking things. But their research led to this development of a class of drugs called checkpoint inhibitors that can turn off the brakes and then unleash the immune system in its full force to fight against disease. IRA FLATOW: Some of those are practical drugs used today, right? SARAH KAPLAN: Yeah. Actually, President Jimmy Carter in 2015 underwent immunotherapy as part of his cancer treatment. IRA FLATOW: Let’s talk about the two women who won prizes. Is the Nobel Committee working to be more diverse, do you think? SARAH KAPLAN: Yeah. So this was a big year, because two women were among the Nobel laureates, which seems like a low bar, but given the history of the prizes, it’s actually pretty exciting. Arnold is only the fifth women to receive the chemistry prize. And Strickland is only the third woman to receive the physics prize and actually the first in 55 years. And that’s not because women haven’t been doing prize worthy work. In physics, a lot of people talk about these amazing women like Vera Ruben, who found evidence for dark matter. Chien-Shiung Wu, who worked on the Manhattan Project, was called the first lady of physics. These are women who were pioneers in their field and never received the prizes because of implicit and explicit biases in the way the prizes are awarded. But the Royal Swedish Academy actually has asked nominators to start considering gender geography and topic in the nominations for prizes starting in 2019. So they say they’re taking steps to try to address those biases. IRA FLATOW: Well, Dr. Arnold is going to be with us in a little bit. I’m going to ask her about that. In other news, there was a big climate meeting this week, right? SARAH KAPLAN: Yeah. So actually right as we speak, scientists and representatives of more than 100 countries are meeting right now in Korea to assess the chance of limiting climate change to the sort of moderate, manageable level, which is considered 100– sorry, not 100. That would be a lot. 1.5 degrees Celsius or 2.7 degrees Fahrenheit above pre-industrial levels. So 1.5 is kind of seen as the guard rail. That’s the most we can endure without having kind of cataclysmic consequences. And a leaked report that came out a few months ago actually found that our chance of hitting that is very low, basically unless there is a massive deployment of technologies to remove carbon from the atmosphere, which doesn’t really exist at that scale. And so these conversations right now are basically like, how dire is the situation, and what language could possibly express what needs to be done, basically, to meet that guardrail? IRA FLATOW: Finally, there’s some really interesting space news, a story about a dwarf planet, but not Pluto. SARAH KAPLAN: Not Pluto. This is actually even more of a dwarf than Pluto. It’s a teeny tiny little guy way out at the edge of the solar system that actually has been called the Goblin, because it was first detected around Halloween a few years ago. And it’s one sixth the size of Pluto. It’s about the width of Massachusetts, 300 kilometers. And it’s this object that was first detected by this super telescope in Hawaii and then confirmed through repeated observations. And it has a really weird lopsided orbit that takes it way out beyond most of the rest of the giant planets in our solar system, Jupiter and Saturn and Uranus and Neptune. And it actually takes 40,000 years to circle the sun. And this dwarf planet is really exciting to researchers because its skewed orbit is so weird that they suggests that there’s something out there. They call it a massive perturber that maybe is shepherding it and other dwarf planets around the edge of the solar system. And so this Planet Nine, or Planet X as it’s sometimes called, that people think might be lurking way out in the dark out there, now that we have the Goblin, it’s another suggestion that it’s there. IRA FLATOW: Those who believe that Pluto’s still a planet call the X the 10. IRA FLATOW: All right, Sarah. That’s fascinating. Thank you for taking time to be with us today. IRA FLATOW: Sarah Kaplan, science reporter at the Washington Post.